"Dying on the Vine" chronicles 150 years of scientific warfare against the grapevine's worst enemy: phylloxera. In a book that is highly relevant for the wine industry today, George Gale describes the biological and economic disaster that unfolded when a tiny, root-sucking insect invaded the south of France in the 1860s, spread throughout Europe, and journeyed across oceans to Africa, South America, Australia, and California - laying waste to vineyards wherever it landed. He tells how scientists, viticulturalists, researchers, and others came together to save the world's vineyards and, with years of observation and research, developed a strategy of resistance. 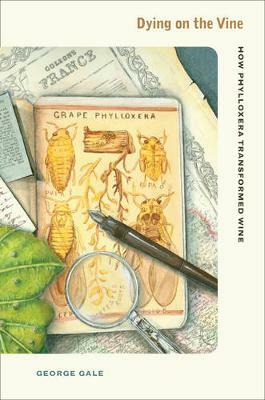 Among other topics, the book discusses phylloxera as an important case study of how one invasive species can colonize new habitats and examines California's past and present problems with it.